President Recep Tayyip Erdoğan said on Tuesday that changing from a parliamentary to a presidential system is a necessity for Turkey given that the current system is "a serious hindrance to the government." Erdoğan touched on various developments that top the country's agenda, one of which is the debate on changing to a presidential system. As he hosted mukhtars – headmen who keep official records of communities – at the presidential palace for the fourth time since its completion, he reiterated previous remarks on the subject, saying that the current parliamentary system is an obstruction to the efficiency of putting decisions into effect. He also highlighted the necessity of a new constitution in the speech he delivered to the community leaders. "I believe we need a new constitution and presidential system for the new Turkey. The presidential system is not foreign to our system. The current system does not fit any more," Erdoğan said. Erdoğan, who claims the current system slows down Turkey's growth, opened the matter to discussion a couple of months ago. Although the idea has been hailed by much of Turkish society, it has been countered with dissent by opposition parties, who express fear of the state becoming authoritarian. However, since the debate has kicked off, Erdoğan has reiterated that the change is a necessity and not his personal will. "It is not my own aspiration to create the presidential system, "Erdoğan said, adding that those who equate a presidential system with a dictatorship are those who fail to count on their nation. "Is there a dictatorship in the U.S?" Erdoğan asked. Throughout modern Turkey's history, the governmental system has been a hotly debated issue that began with the eighth president, Turgut Özal, continued with the ninth president, Süleyman Demirel and has been reinforced by Erdoğan, who asserts that a presidential system is more applicable to the country's political structure. "Mustafa Kemal [Atatürk, the founder of the Turkish Republic], Demirel, [Necmettin] Erbakan and [Alparslan] Türkeş included, they all fell short of time and power to be able to change the system. It is not my personal wish at all. Ultimately, everything will be determined as to how long the elected president will serve and how many times they can be elected. While the global system is going through a dramatic change, it is very hard for Turkey to turn this change into an opportunity within the current system," Erdoğan claimed. When Erdoğan took the presidential office on Aug. 10 last year, with the nation directly electing a president for the first time, he specifically highlighted that he intended to change the political structure. Currently, the president only has ceremonial duties, but Erdoğan pledged to be a more "active" president during his tenure. In previous election terms, the Justice and Development Party (AK Party) reiterated that it aims to receive the constitutional majority to establish a presidential system. "We can put decisions into force swiftly only with speedy execution mechanisms, which is a presidential system. I have experienced this throughout the three terms I was prime minister. 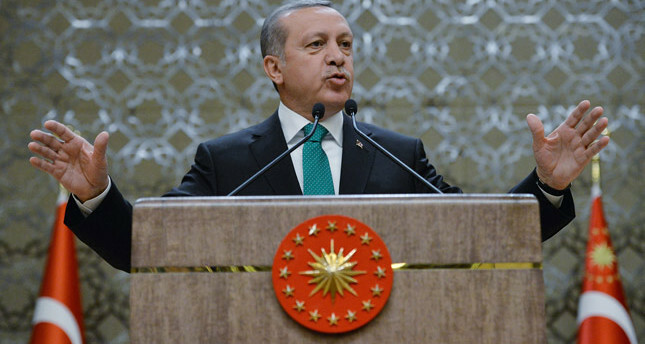 I can see where there are problems," Erdoğan said.